Koi (鯉 or コイ), or more specifically nishikigoi (錦鯉), literally brocaded carp), are ornamental domesticated varieties of the common carp Cyprinus carpio. They are also sometimes called Japanese carp. The carp is a large group of fish originally found in Central Europe and Asia. Various carp species were domesticated in China and South East Asia, where it was used as a food fish. The ability of carp to survive and adapt to many climates and water conditions allowed the domesticated species to be propagated to many new locations including Japan. Natural color mutations of these carp would have occurred across all populations. Historical records indicate that carp were first bred for color mutations in China. Selective breeding of the Prussian carp led to the development of the goldfish. By the Song Dynasty (960 – 1279), yellow, orange, white and red-and-white coloration had been developed. Goldfish were introduced to Japan in the 16th century and to Europe in the 17th century. Of the various domesticated carp species, the common carp is the most commonly raised food fish used in aquaculture. The common carp are known as koi in Japan. Koi were first bred for color in Japan in the 1820s, initially in the town of Ojiya in the Niigata prefecture on the north eastern coast of Honshu island. By the 20th century, a number of color patterns had been established, most notably the red-and-white Kohaku. The outside world was not aware of the development of color variations in koi until 1914, when the Niigata koi were exhibited in the annual exposition in Tokyo. At that point, interest in koi exploded throughout Japan. The hobby of keeping koi eventually spread worldwide. Koi are now commonly sold in most pet stores, with higher-quality fish available from specialist dealers. Koi varieties are distinguished by coloration, patterning, and scalation. Ghost koi, developed in the 1980s are metallic hybrids of wild carp and Ogon koi and are not considered true Nishikigoi. Butterfly koi, Longfin koi, or Dragon Carp were also developed in the 1980s and are notable for their long and flowing fins. They are actually hybrids with Asian carp and, like Ghost koi, are not considered true Nishikigoi. Koi fish are very shy, and will dart away with ease. Goldfish and koi were developed from different species of carp; although they can interbreed, their offspring are sterile. Goldfish were domesticated from the the Prussian carp (Carassius gibelio), whereas koi are the domesticated version of the common carp (Cyprinus carpio). In general, goldfish tend to be smaller than koi, and have a greater variety of body shapes, and fin and tail configurations. Koi varieties tend to have a common body shape, but have a greater variety of coloration and color patterns. They also have prominent barbels on the lip. Some goldfish varieties, such as the common goldfish and shubunkin have body shapes and coloration that are similar to koi, and can be difficult to tell apart from koi when immature. The word 'koi' comes from Japanese, simply meaning 'carp.' It includes both the dull grey fish and the brightly colored varieties. A homophone of koi means 'love, affection' and koi are therefore symbols of love and friendship in Japan: a good example is the short story Koi-san by Mukoda Kuniko. Koi tattoos have become a popular trend in North America. Koi have many different colors. Some of the major colors are white, black, red, yellow, blue, and cream. While the possible variations are limitless, breeders have identified and named a number of specific categories. The most popular category is Gosanke, which is made up of the Kohaku, Taisho Sanshoku, and Showa Sanshoku varieties. * Kōhaku (紅白) A white-skinned koi, with large red markings on the top. The name means 'red and white;' kohaku was the first ornamental variety to be established in Japan (late 19th century). * Taishō Sanshoku (or Taisho Sanke) (大正三色) Very similar to the Kohaku, except for the addition of small black markings called sumi (墨). This variety was first exhibited in 1914 by the koi breeder, Gonzo Hiroi, during the reign of the Taisho Emperor. In America, the name is often abbreviated to just 'Sanke'. The kanji, 三色, may be read as either sanshoku or as sanke. * Shōwa Sanshoku (or Showa Sanke) (昭和三色) A black koi with red (hi 赤) and white (shiroji 白地) markings. The first Showa Sanke was exhibited in 1927, during the reign of the Showa Emperor. In America, the name is often abbreviated to just Showa. The amount of shiroji on Showa Sanke has increased in modern times (Kindai Showa 今代昭和), to the point where it can be impossible to distinguish from Taisho Sanke. The kanji, 三色, may be read as either sanshoku or as sanke. * Tanchō (丹頂) Any koi with a solitary red patch on its head. The fish may be a Tancho Showa, Tancho Sanke, or even Tancho Goshiki. Named for the Japanese crane (Grus japonensis) which also has a red spot on its head. * Asagi (浅葱) A koi that is light blue above and red below. The Japanese name means 'light blue.' Sometime incorrectly written as 浅黄 (light yellow). * Utsurimono (写り者) A black koi with a white, red, or yellow markings. The oldest attested form is the yellow form, called 'Black and white markings' (黒黄斑 ,Kuro Ki Han) in the 19th century, but renamed Ki Utsuri (黄写り) by Elizaburo Hoshino, an early 20th century koi breeder. The red and white versions are called Hi Utsuri (赤写り) and Shiro Utsuri (白写り) respectively. The word utsuri means to print (the black markings are reminiscent of ink stains). * Bekko (鼈甲) A white-, red-, or yellow-skinned koi with small black markings sumi (墨). The Japanese name means 'tortoise shell,' and is also written as べっ甲. The white- red- and yellow varieties are called Shiro Bekko (白) Aka Bekko (赤) and Ki Bekko (黄) respectively. May be confused with the Utsuri. * Goshiki (五色) A black koi with red, white, brown, and blue accents. * Shūsui (秋翠) The Japanese name means 'Autumn jade.' The Shusui was created in 1910 by Yoshigoro Akiyama, by crossing Japanese Asagi with German mirror carp. The fish has no scales, except for a single line of large mirror scales dorsally, extending from head to tail. The name is sometimes also written as 秋水. * Kinginrin (金銀鱗) A koi with metallic scales. The name translates into English as 'gold and silver scales.' Often abbreviated to Ginrin. 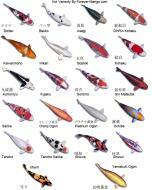 There are Ginrin versions of almost all other varieties of koi, and they are fashionable. * Ōgon (黄金) A koi of one color only, but with metallic scales (ginrin 銀鱗 or hikarimono 光者). The most commonly encountered colours are gold, platinum, and orange. Cream specimens exist but are very rare. Ogon compete in the Kawarimono category and the Japanese name means 'Gold.' The variety was created by Sawata Aoki in 1946 from wild carp he caught in 1921. * Kumonryū (九紋竜) Kumonryu is a black fish with curling white markings. The patterns are thought to be reminiscent of Japanese ink paintings of dragons. They famously change colour with the seasons. Kumonryu compete in the Kawarimono category. * Doitsu-goi (ドイツ鯉) A German mirror carp with only a single line of large mirror-like scales along the top. Also written as 独逸鯉. * Koromo (衣) Koi with patches of blue- or black-edged scales. This variety first arose in the 1950's as a cross between a Kohaku and an Asagi. The most commonly encountered Koromo is an Ai Goromo, which is coloured like a Kohaku, except that each of the scales within the red patches has a blue- or black-edge to it. * Hikari-moyomono (光模樣者) A koi with coloured markings over a metallic base, or koi in two metallic colours. * Ghost koi - 'hybrid' of Ogon and wild carp. Not Nishikigoi. * Butterfly koi - long-finned version of all others. Not Nishikigoi. Bred in America and introduced back into Japan. The common carp is a hardy fish, and koi retain that durability. Koi are cold-water fish, but benefit from being kept in the 15-25 degrees C (59-77 degrees F) range and do not react well to long cold winter temperatures, their immune system 'turning off' below 10 degrees C. Koi ponds have a meter or more of depth in areas of the world that become warm during the summer. In areas that have harsh winters, ponds that are a minimum of 1.5 meters (4 1/2 feet) are most common. Koi's bright colors put them at a severe disadvantage against predators; a white-skinned Kohaku is a visual dinner bell against the dark green of a pond. Herons, kingfishers, raccoons, cats, foxes, and badgers are all capable of emptying a pond of its fish. A well-designed outdoor pond will have areas too deep for herons to stand in, overhangs high enough above the water that mammals can't reach in, and shade trees overhead to block the view of aerial passers-by. It may prove necessary to string nets or wires above the surface. A pond usually includes a pump and filtration system to keep the water clear. Koi are an omnivorous fish and will often eat a wide variety of foods, including peas, lettuce, and watermelons. Koi food is designed not only to be nutritionally balanced, but also to float so as to encourage them to come to the surface. When they are eating, it is possible to check koi for parasites and ulcers. Koi will recognize the person feeding them and gather around him or her at feeding times. They can be trained to take food from one's hand. In the winter, their digestive system slows nearly to a halt, and they eat very little, perhaps no more than nibbles of algae from the bottom. Their appetite will not come back until the water becomes warm in the spring. When the temperature drops below 50 degrees Fahrenheit (10 °C), feeding, particularly with protein, is halted or the food can go rancid in their stomach, causing sickness. Koi can live for decades. One famous scarlet koi, named 'Hanako' (c. 1751 – July 7, 1977) was owned by several individuals, the last of which was Dr. Komei Koshihara. Hanako was reportedly 226 years old upon her death. Her age was determined by removing one of her scales and examining it extensively in 1966. She is (to date) the longest-lived koi fish ever recorded. Like most fish, koi reproduce through spawning in which a female lays a vast number of eggs and one or more males fertilize them. Nurturing the resulting offspring (referred to as 'fry') is a tricky and tedious job, usually done only by professionals. Although a koi breeder may carefully select the parents they wish based on their desired characteristics, the resulting fry will nonetheless exhibit a wide range of color and quality. Unlike a purebred dog or cat, even the finest champion-grade koi will produce literally thousands of unacceptable, unrecognizable, or even genetically defective offspring in a single spawning. These (and hundreds of marginal offspring) are culled at various stages based on the breeder's expert eye and closely guarded techniques. Culled fry are usually destroyed (perhaps fed to other fish) and older culls are often sold as lower-grade 'pond-quality' koi within their first year (also called 'Tosai') at 3'–6' long. The semi-randomized result of the koi's reproductive process is both a blessing and a curse. While it requires diligent oversight to narrow down the favorable result that the breeder wanted all along, it also made possible the gradual transformation of wild river carp into the exquisite art form seen in modern nishikigoi. Koi have been accidentally or deliberately released into the wild in every continent except Antarctica. They greatly increase the turbidity of the water because they are constantly stirring up the substrate. This makes waterways unattractive, reduces the abundance of aquatic plants, and can render the water unsuitable for swimming or drinking even by livestock. In some countries, koi have caused so much damage to waterways that vast amounts of money and effort have been spent trying to eradicate them, largely unsuccessfully.